This practice requires the student to have permission/empowerment received from a qualified master in order to engage in the self-generation of the deity. However, it is permitted to do this practice without such an empowerment as long as you do not generate yourself as the deity. Instead, you should generate the deity at the crown of your head or in front of you instead of self-generation. Tara is a completely enlightened buddha who had previously promised to appear, after enlightenment, in the form of a female bodhisattva and goddess for the benefit of all beings. Her primary activity is to protect from the eight fears. Tara or simply Drol-ma in Tibetan, goddess of protection and compassion, is one of the widest worshiped deities in Tibet. 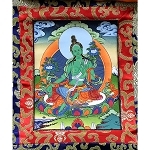 Tara represents the miraculous activities of all buddhas. 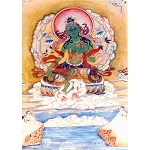 In myth she is born from Chenrezig's tears of compassion. 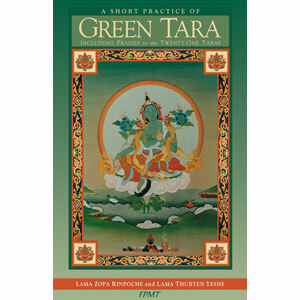 There are innumerable manifestations of Tara arising according to sentient beings' needs, such as the dynamic Green Tara who quickly overcomes obstacles and saves beings in dangerous situations. While cultivating the wish that all of our endeavors ultimately benefit others, we can call upon the power of Tara to get things done in a most amazing way. Whether you are looking for the right partner in a relationship or wishing to find the conditions for entering into a life of solitary retreat, the practice of Tara can help. Staple binding. 29 pages, 2003 edition.